Lying to the east of Bali, Lombok has wonderful beaches, enchanting waterfalls, Indonesia’s second highest volcano, unspoilt forests and stunning landscapes. In addition to its natural beauty, Lombok has a rich and endearing culture, with its indigenous Sasak people being one of the many unique attractions of the island. Lombok is an ideal place for those looking for a private holiday away from the hustle and bustle of a normal tourist destination. Nothing happens quickly in Lombok and visitors who are stressed from their daily lives find Lombok a delightful place to unwind. Though less developed than Bali, in recent years Lombok has begun to appeal to many visitors seeking an alternative to the crowds and expectations of Bali, especially now that it is so easy accessible with daily fast boats direct to Lombok. The resort area of Senggigi in West Lombok now has an extensive choice of accommodation to suit all budgets, along with some of the best restaurants and bars on the mainland. Southern Lombok attracts surfers and beach-bums alike, all looking for that perfect ride or deserted pristine beach, while Central and East Lombok boasts rice paddies, tobacco growing areas and some established tropical nature reserves. To the north lies the impressive Mount Rinjani with its crater-lake and breath-taking views; on a clear day you can even see Gunung Agung on Bali to the west over the sparkling sea. And if the mainland isn’t enough, you can always escape to the paradisical Gili islands. Lying just off the north-west coast, this group of three small islands - often described as ‘pearls in the ocean’ - offer pristine waters, great diving, snorkelling opportunities, affordable accommodation and laid-back charm. Kuta and South Lombok – Located on Lombok’s southern coast, Kuta and the surrounding area draws visitors to its magnificent stretches of white sandy beaches, secluded bays and world-class surf. Spend a day at pristine Mawun or Selong Belanak beaches, superb for swimming in their clear turquoise-tinged waters. The area is still relatively undeveloped, although Selong Belanak has a number of beach front restaurants and is a favourite spot for the surf schools. Senggigi – Spread along 10km of coastal road, Senggigi is the most developed tourist area in Lombok. Senggigi is a great base for exploring the rest of the island. The pace is laid-back, with activities revolving around the beaches and day trips to places of interest within a few hours’ drive. A good variety of restaurants, bars, nightclubs, ameneties and a wide range of accommodation. And if you’re travelling to the Gili islands from Senggigi you’ll be rewarded with some breath-taking views of the islands en route. The well-maintained coastal road takes you through local villages, along steep cliffs, coconut groves and deserted sandy bays. Pura Batu Bolong – Small Hindu temple located in a scenic spot on a small headland overlooking Senggigi beach. Named after a rock (batu) with a hole in it (bolong) it is said that virgins were once sacrificed to the sea from the seat-like rock at the outermost point. Admission and ‘loan’ of a compulsory temple-sash are by donation. This is a great place to watch the sunset, with fantastic views across to Gunung Agung on Bali. And if you’re here around full moon you might see one of the colourful Hindu ceremonies that are held here every month. Traditional handicraft villages – Dotted around the island are a number of simple Sasak villages producing a variety of traditional handicrafts. For unique pottery, head for the famous villages of Banyumulek (West Lombok), Penujak (Central Lombok) and Masbagik (East Lombok). If you’re after textiles, there’s the weaving villages of Sukarare (West Lombok), Puyung (Central Lombok) and Pringgasela (East Lombok), where traditionally dressed women weave brightly patterned songket and ikat cloth on wooden handlooms. The cloth is then used to make sarongs and other types of clothing. Good for day trips from the Gilis are a fascinating traditional village is Dusun Desa Beleq, in Desa Gumantar, there is also a waterfall about 2km away, and another village is Segentar in the north. Sindang Gila & Tiu Kelep Waterfalls – Located near Senaru on the slopes of Mount Rinjani these waterfalls often form part of an organised Rinjani trek or can be visited on their own. It’s about a 20 minute trip down the long run of steps and trail to the splendid Sindang Gila falls (Senaru’s “1st waterfall”); popular with both visitors and locals alike. Enjoy a refreshing swim before taking the climb back up again or continue on to Tiu Kelep (Senaru’s “2nd waterfall”); which is a further 1 hour walk. It might be worth taking a reputable guide to these 2nd falls as the path isn’t that clearly marked. You’ll need to wade through the river to reach the falls so make sure you’ve got flip-flops or sandals to save getting your shoes wet. There is a deep pool at the top where you can swim and jump off rocks, and a dark tunnel with a concrete shoot that can be used as a water slide. Pura Lingsar Temple – With two holy shrines, this important religious site is the only place on Lombok where all faiths – Hinduism, Buddhism, Christianity and Islam – come together to pray for prosperity, fertility, rain, health and general success. Built in 1714, this sacred site still contains some of the original animist statues. It’s also famous for the spring-fed pools which are home to a family of holy eels, who can be lured out of their hiding spots with hard-boiled eggs. You can purchase eggs from stalls outside the temple to feed the eels yourself. In mid-December, Pura Lingsar hosts the temple festival of Perang Topat. During this festival, representatives of the Hindu and Wektu Telu communities put on an elaborate costumed parade and then square off for a wild mock-battle in which the weapon of choice is ketupat - balls of sticky-rice wrapped in coconut leaves. Climb a Volcano - Soaring 3726 above sea-level the magnificent Gunung Rinjani is Indonesia’s second highest volcano and Lombok’s defining landmark. If you’ve got the stamina, the best way to enjoy this National Park is to go on an organised trek. There are a couple of main routes that wind up the sides of this great peak until you reach the rim of a vast caldera, where there’s a jaw-dropping view of Rinjani’s sacred Crater Lake (an important pilgrim site) and the smoking, highly active mini-cone of Gunung Baru Jari below. Several reputable companies offer packages that range from moderate 2D/1N hikes to the crater rim up to more demanding 5D/4N treks that take in the crater-lake, hot springs and the volcano’s summit. Try to avoid planning a visit in wet season as heavy rainfall can cause the park to close for certain periods. Enjoy 10% discount on all Rinjani trekking Center packages and services when you book your fast boat with Gilibookings.com. Surf the Desert - On its day, Desert Point is regarded as one of the best waves on the planet! If you’re an experienced surfer and there’s a decent swell, you can expect barrels, tubes and some of the sickest surfing on Lombok. Located at Banko Banko at the western tip of Lombok. Go fishing - The waters around Lombok are teaming with fish, so it’s surprising that this island has been long forgotten by many sport fishermen. Fishing charters - with professionally organised boats or, for the intrepid, more informal arrangements with local perahu (outrigger boat) operators on the beaches of Lombok - are available for day trips or longer. The region is ideal for both trolling and deep fishing, with the chance to catch trevally, Spanish mackerel, marlin, sailfish, tuna, wahoo, Mahi Mahi and numerous reef fish. Dive with the ‘Big Dogs’ - South Lombok offers some spectacular diving opportunities for the experienced diver. Belongas Bay is host to the legendary Magnet – a pinnacle in about 80m of water, famed for attracting the ‘Big Dogs’ of the ocean such as schooling hammerheads, barracuda, tuna and devil rays that all congregate in the strong currents. Being exposed to open sea means surges and potential downdrafts, so it’s essential to have a good guide who knows the sites. Dive Zone specialises in dive trips to this unforgettable area. Have a traditional massage - Often found on Senggigi and Mangsit beaches, local Sasak women offer traditional and therapeutic massages. Not only for tourists, these therapeutic and remedial treatments are also in great demand by local people for a wide range of ills. Sink a hole in one! - Lombok is well equipped to meet the needs of golf enthusiasts and for those with golf on their mind there are two 18-hole courses to choose from - the uncrowded Lombok Golf Kosaido Country Club and the Rinjani Country Club & Resort. Located on the north-west coast, the serene atmosphere of Kosaido offers magnificent views of Mt. Rinjani and the Gili Islands. Host to Indonesia’s first PGA tour, the Rinjani Country Club is situated 500 meters above sea level just outside Lombok’s largest city – Mataram. The course, architected by Jack Nicklaus, is designed to ensure playability for all level of golfers. Most of the better restaurants and bars are around Senggigi with some located in Mataram. There are plenty of local warungs serving typical Lombok dishes such as Nasi Campur or Ayam Taliwang – the food is usually very tasty and often quite spicy. Square - Restaurant & Lounge (Senggigi) – Open and airy with a contemporary design, theme and menu. Serving some of the best western food in Lombok, from juicy imported steaks to succulent fish dishes, their extensive menu will have you coming back for more. Asano (Mataram) – For fans of Masakan Padang (Padang cuisine) this long-time favourite is a must. Located opposite the side entrance to Mataram Mall, you can expect to find some of the best Beef Rendang in Lombok along with all the usual array of dishes at this 24hr restaurant. Laut Biru Restaurant (Selong Belanak) – Part of Sempiak Villas this excellent restaurant & bar serves great food with stunning views over Selong Belanak beach. If you’re in the south don’t miss the opportunity to dine here. Ashtari Coffee House (Kuta) – located on a hill with fantastic views of Kuta and along the south coast. Relax and enjoy their daily fresh menu; great for vegetarians. Café Alberto (Senggigi) – This beachside Italian restaurant, just south of the Senggigi, offers homemade pastas, fresh fish, great pizzas and more. For a romantic meal ask for a spot on the beach where intimate tables, illuminated only by torches, create a beautiful setting for sunset or moonlight dining. Aroma – (Mataram) – This highly recommended Chinese and seafood place is very popular with tourists and locals alike. The chilli crab is a house speciality. Prices are low and portions are generous. Asmara (Senggigi) – If you’re a family travelling together, why not try this popular restaurant near the Art Market, which has high quality European food at reasonable prices. Street food – Most towns will have their share of vendors selling anything from various types of satays to Bakso (Indonesian meatball) soup or Martabak (savoury-filled thin pancakes). Another favourite, especially with the kids, is Terang Bulan (very sweet thick pancakes filled with chocolate, nuts or sweetened condensed milk). Marina Cafe (Senggigi) – The hottest place to party in Lombok! Right in the heart of Senggigi the legendary Marina’s brings you the best in drink, music and nightly live entertainment. Sahara Club (Senggigi) – A lively and fun club in Senggigi Plaza featuring live bands and special guest DJ's from across the nation. If you have enough time, get a fast boat ticket and explore the Gili Islands. Each of the Gilis has its own beauty and a wide range of activities to offer. 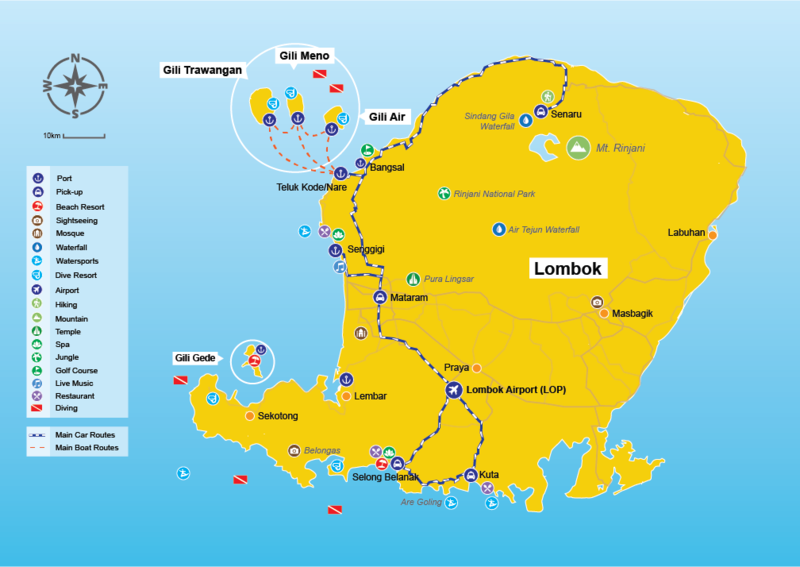 If you are staying in Lombok, we recommend at least a day trip from Lombok to Gili Air, Gili Meno or Gili Trawangan. From Senggigi area, the quickest way to get to Gili is with one of the scheduled fast boat which you can book using our Search box. Crossing time is approximately 20 minutes depending on the sea conditions. If you're going to the Gili Islands from elswhere in Lombok or if you need a Lombok airport transfer, we suggest you book a private car and speedboat for maximum comfort through our sister site Gili-islandtransfers.com. Local public boats are also cheaply available from Bangsal harbour in north Lombok, but beware of the hawkers and scams!